Taxi drivers tricking customers into paying higher fares isn't exactly news. But a recent survey of the scene in Shenzhen done by a local news outlet is alarming: it shows not only how widespread the problem is, but also how far it is from being resolved. Green taxis, it turns out, are some of the most notorious for quietly inflating customers' fares. They operate outside the central districts of Shenzhen, which might give them some immunity against government oversight. On August 30, just a couple weeks ago, one man fell victim to a particularly bad scam from a green taxi driver. Mr. Xue had just traveled from Nanjing to Shenzhen on business, and wanted to catch a taxi to his hotel. After waiting in the designated area, he got inside a green taxi. A green taxi pickup area in the winter. It wasn't long before Xue realized something was wrong. Only 8 kilometers into his ride, the meter showed close to 17 kilometers, and the fare had already passed RMB45. Xue made a half-joking comment to the driver about using "speed up devices," a reference to the gadgets taxi drivers sometimes install in their vehicles to make the meter run faster. Although he was angry, Xue eventually ended up striking a deal with the driver. He felt there was little choice, as a traveler in an unknown city. A police officer examining what he suspects to be a "speed up device" in a green taxi. Later, he commented that while taking an extra RMB3-5 was understandable, his own driver had asked for too much. Unfortunately, sketchy green taxi drivers seem to be a problem that won't go away anytime soon. Only this past June, taxis at Shenzhen's Fuyong Port were reported as charging outrageous prices, such as RMB400 for 12 kilometers. The situation hasn't changed much since then. A reporter at Fuyong Port recently asked to be taken to Bao Li Lai Hotel, a short 12km away. It should have been priced RMB40 at the most. Instead, a green taxi driver made an offer of RMB200, and he was even backed up by a fellow driver. 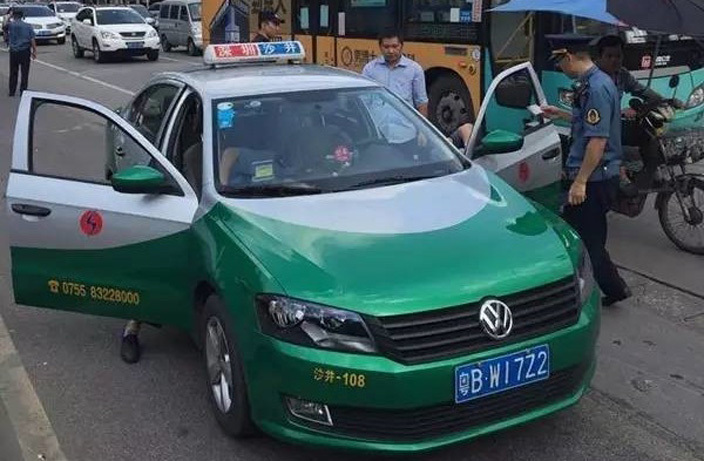 At Shenzhen Airport, where many tourists get ripped off, the reporter found Shenzhen traffic control officers checking green taxis for any equipment that might be illegally speeding up meters. Some, commonly called "meter devices," can be used to remotely control the taxi meter. Drivers often hide them underneath the steering wheel, where they can be covered up with tape. A meter device and its remote control pad. As the officers went through the taxis, the reporter saw drivers hiding their "meter devices" away. Still, within 10 minutes the enforcers caught five drivers red-handed. Some of them didn't even have the proper license to drive a cab. But the violators don't have too much to fear. As an officer at the scene stated, drivers are fined only RMB2,000 for having a meter device. Their licenses are not revoked for the offense, nor are their vehicles impounded. In theory, then, it wouldn't take much for them to get back on the streets and begin scamming again.